was one of the earliest Convent school to accept male pupils. STUDENTS at the SK Convent Tanah Rata probably enjoy the highest located school on this side of the country. The school is also the highest landmark overlooking Tanah Rata (at 1,440 metres above sea level), which is the largest town in Cameron Highlands. a jam packed pasar malam. According to available reference materials, the primary school began as a boarding school named Pensionnat Notre Dame. Officially opened on May 1, 1935, it was built on land allocated by the Sultan of Pahang of the time. It was originally set up for the daughters of English workers at the tea plantations on the highlands. However, the Convent began accepting boys since the 1960s when the government took over part of its administration. Tanah Rata, which means flat land in Malay, is a bustling township now increasingly populated by hotels and guest houses for the growing number of tourists. There are travel agents, banks, money changers, sundry shops, fast food outlets, and 24-hour restaurants. There is even a Starbucks Coffee outlet at the main road, Jalan Besar. 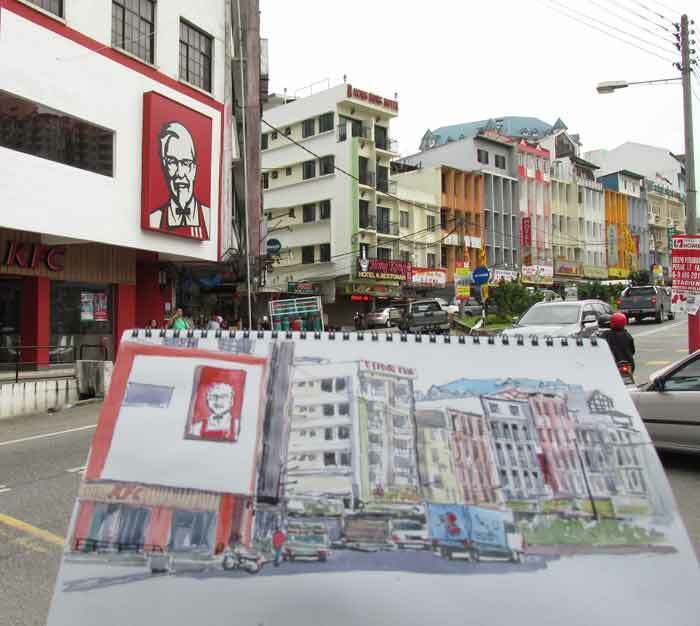 The second largest town in Cameron Highlands is Brinchang, located about six kilometres from Tanah Rata. This is also the highest township on the highlands. Its main attraction is a pasar malam that operates during weekends and public holidays. Brinchang also has its fair share of restaurants, hotels and guest houses. Many of Cameron Highland’s attractions are located near Brinchang and during peak tourist periods, the jams here can rival that of many Malaysian cities, say my tour guide. These two sketches were made during the short respites from the heavy downpours that marked by two-day stay in Cameron Highlands. 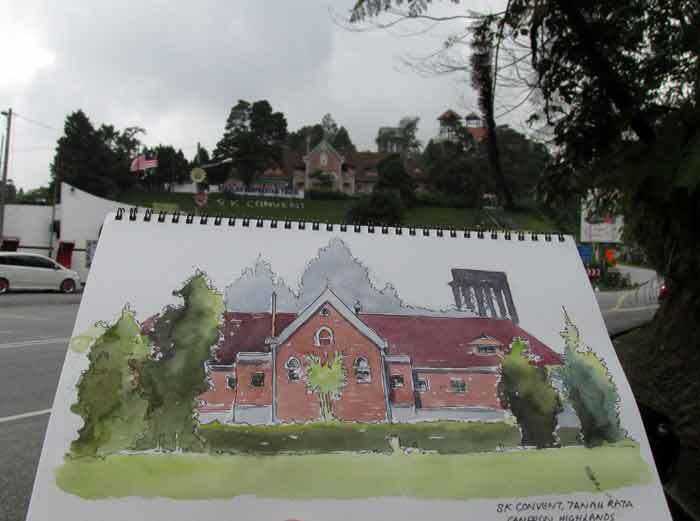 A makcik who saw me struggling with the colours while painting the Convent advised that I visit Cameron Highlands from March to July as the weather would usually be more forgiving. If you are heading up to Cameron Highlands, there are several roads that you can take. From the west coast of the Peninsula, the more popular ones off the North-South Expressway are the Tapah old road from the south or Simpang Pulai from the north. Having used both during this trip, I feel that the Simpang Pulai approach is a better alternative as the road is wider and has fewer heart-stopping bends. If you are going up from Tapah, it helps to switch on the GPS so that you can be aware of bends ahead, as there are many narrow ones that may literally take your breath away. Drive slowly as chances are that you can expect to see vegetable lorries and tour buses race down the other side of the road. The Sunday morning market in Rasa Town. I was trying to escape the haze last week when I took a 70km drive to Rasa in Hulu Selangor. It wasn't very successful but I did enjoy myself having a plein aire session there. Rasa is a single street rural town lined by two rows of pre-War shophouses. 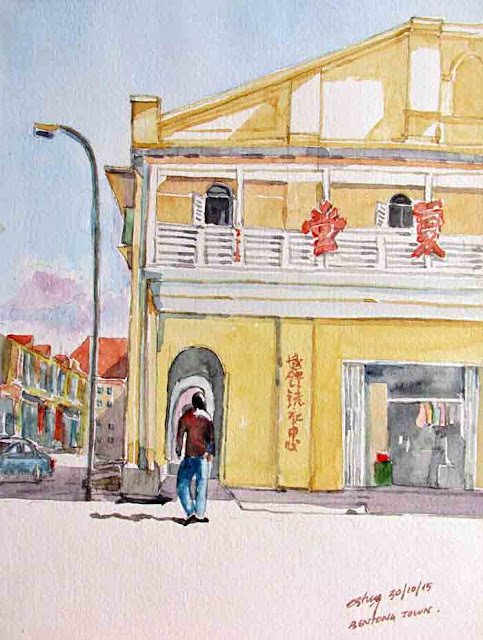 With a residents profile of predominantly Malays and Chinese, there are several housing estates surrounding it. 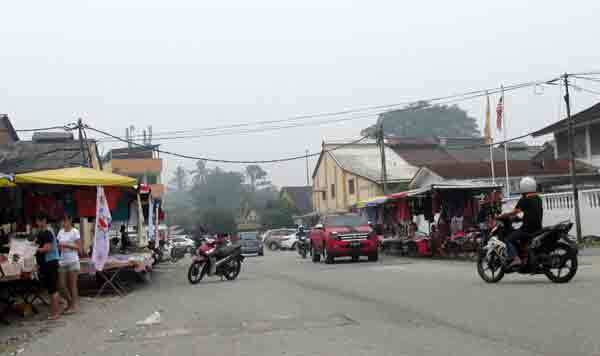 The Rasa Komuter station is at the side of the town and it was where one could still find some very old double-storey mansions and shop houses, some abandoned but some still inhabited. 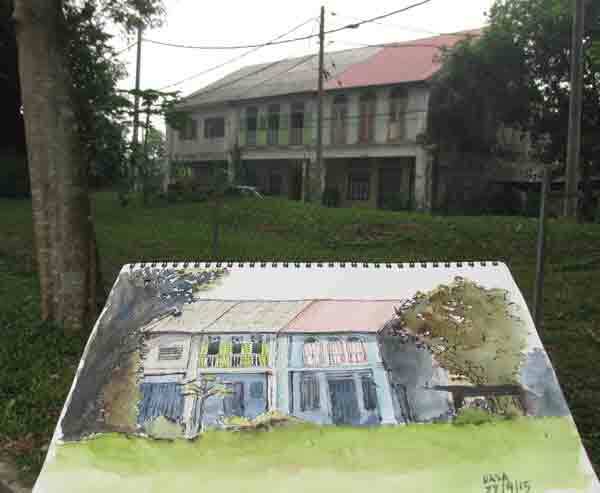 The air was so thick with haze that I decided to do a quick sketch of four shop houses facing the Rasa train station.